We haven’t been out training for at least week due to the snowy weather conditions closing our training grounds. Snow is great, but it closes roads and makes trees fall down over trails. 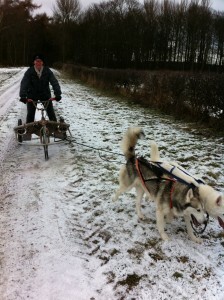 This entry was posted in Training Huskies and tagged christmas, husky, training on December 25, 2010 by Guy Redwood. I can’t remember when I bought my first pair of inov-8 running shoes, maybe 5 years ago. 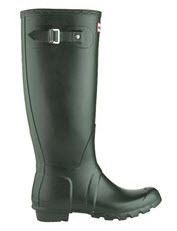 I’d read about them online, after wanting something that was more suited to running than my Hunter wellies. At the time, the only other alternative in the fell running category were the traditional Walsh shoe which seemed positively primitive when compared to the inov-8s. I was one of the first mushers to start using them for dryland husky racing – the combination of wet trails, mud and snow made them ideal. There’s now a huge range to choose from with even more amazing features. 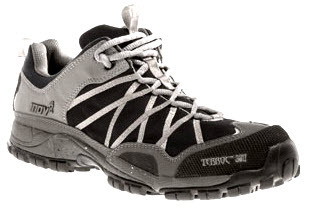 This entry was posted in Husky Equipment and tagged fell running, inov-8, inov8, terroc, trainers on December 18, 2010 by Guy Redwood. Torches have improved hugely since we got our first huskies. They’re now alot brighter, lighter and the batteries last much much longer. We’ve tried many different brands of torch and now just stick with Petzl. I think Petzl call them ‘head lamps’, which must be a throw back to their origins when they invented the concept of putting a lamp battery case on a head strap. I’m pretty sure we could open a mini museum illustrating the evolution of the Petzl head torch over the last decade with all the versions we own. We use the torches for walking the dogs in winter evenings, sorting stuff out at races in the dark or just finding our way back from the pub. This entry was posted in Husky Equipment and tagged head lamp, head torch, petzl, tactikka, zipka on December 18, 2010 by Guy Redwood. More often than not, we’re out with the huskies in the rain. It wasn’t until we bought our first husky that I owned my first pair of Hunter Wellies. Up until that point, I’d thought a welly was a welly. How wrong was I! This entry was posted in Husky Equipment and tagged hunter, wellies, wellington boots on December 18, 2010 by Guy Redwood. 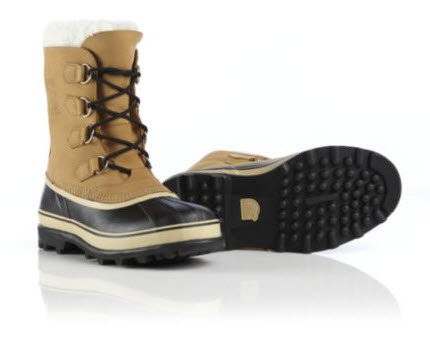 This entry was posted in Husky Equipment and tagged boots, caribou, cold weather boot, sorel on December 18, 2010 by Guy Redwood. Dr. Billinghurst’s most important piece of writing is the book “Give Your Dog a Bone.” Because cats and dogs have different food requirements, (cats are obligate carnivores while dogs are omnivores with a carnivorous background), he decided they each needed their own book, and that he would write the dog book first. Thus was born “Give Your Dog a Bone.” This book was launched at a 3 day Bichon Frise conference in western Sydney on the 17th November 1993. The book was advertised in all the canine breeder magazines throughout Australia. This entry was posted in Husky Books and tagged barf, dog a bone, healthy dog food book, raw diet on December 18, 2010 by Guy Redwood. The Complete Siberian Husky by Chris & Caroline Kisko and Sheila & Simon Luxmoore is ideal for those thinking of getting a siberian husky, as well as those wanting to learn more about working, showing, breeding & health of Siberians. This entry was posted in Husky Books on December 18, 2010 by Guy Redwood. Gary Paulsen was in his forties, an internationally famous children’s writer. Then he was overtaken by his passion – a passion for Alaskan dog-racing and a passion for the wild, beautiful landscape of the Arctic. Winterdance is the story of this passion. 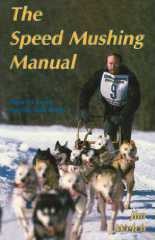 The Speed Mushing Manual by Jim Welch is an invaluable reference guide for buying, breeding, feeding, conditioning, training, equipping and racing sled dogs. This entry was posted in Husky Books and tagged husky racing, husky training, mushing, sled dog racing, training sled dogs on December 18, 2010 by Guy Redwood. Early start to a Sunday morning saw us traing at Crosscliff in Dalby Forest. I took Basil, Mookie, Benny and Snowy out for a 3 mile loop. Had a few issues getting snowy and mookie to go round and not under the first forest gate. Then Benny decided he would go the opposite side of a post to the others, which brought him to a halt fairly quickly. Just running one team meant we did the whole trip in 3 hours. First night rally is looming, guess we should charge the batteries. This entry was posted in Racing Huskies, Siberian Huskies, Training Huskies on October 24, 2010 by Guy Redwood.